ISBN 1934163287. 12 x 9 inches. 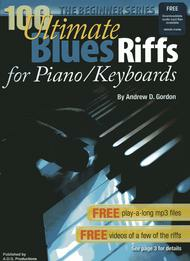 100 Ultimate Blues Riffs for Piano/Keyboards, the Beginner Series by musician, educator and world renowned author Andrew D. Gordon is an exhaustive guide to introduce beginner students to the various phrases or "riffs" that make up Blues piano playing, both from a rhythmic and soloing standpoint. There are five sections to the riffs in the book, section 1 contains basic Blues riffs, section 2 contains Rhythm & Blues influenced riffs, section 3 contains Boogie Woogie riffs, section 4 contains Rock influenced Blues riffs and section 5 contains Gospel influenced Blues riffs. 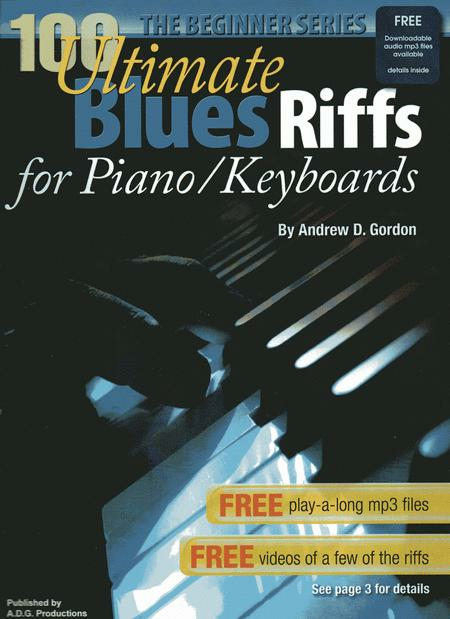 Included with this book is online audio that contains all the riffs, recorded twice: first, piano with bass and drums and second just bass & drums so you can play-a-long.